Am having 'blog posting fever' as I have nothing much to do at home (well only for 2 more weeks anyway before I go back to work). So I will keep on posting about what I cook or what I do everyday. Anyway, just finished cooking this in the morning when baby Gavin has fell asleep. I could not sleep when baby sleeps as I have house chores to do. 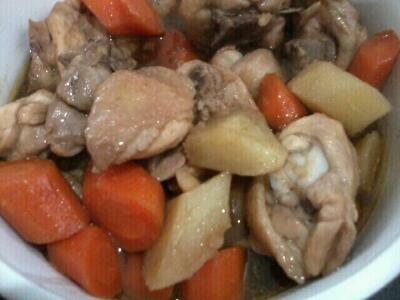 This is what I called the one-pot dish ~ braised chicken with carrots and potatoes. Tonight, I will just need to boil rice, that's all. Or quick-boil a spinach soup with ikan bilis and wolfberries. Chuck in some assorted balls if desired. Simple heh? Once I go back to work, will consider cooking a large batch of one-pot dish like this during the weekend (if I have the mood) and freeze it so that we can heat up and have home-cooked food for dinner on weekdays.